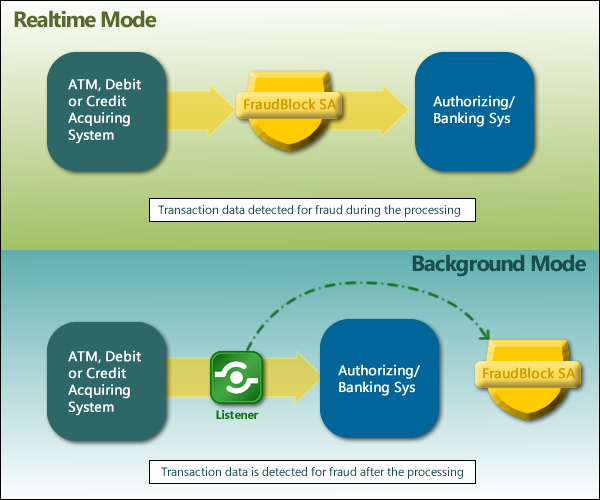 FraudBlock™ SA is an isolated instance of FraudBlock that can serve either for real-time fraud protection or for background (near real-time) protection. The Standalone edition is meant to be installed independent from other systems, and does not require integration with an existing SWITCHWARE® or EZswitch® system. A turnkey solution that integrates seamlessly with almost any FI switch or card authorizing system used for debit/credit processing, FraudBlock SA is meant for customers who wish to license an isolated, standalone fraud protection solution. Issuer-based transactions that pass through FraudBlock are tested against rules that identify, block, or warn of fraud taking place. The real-time mode provides online authorization decisions to identify and prevent fraudulent activity before it happens. The background mode accumulates historical data to identify fraudulent activities and patterns without making online authorization decisions. The system’s architecture is flexible and highly parameterized. The intuitive user interface allows for easy performance of system configuration and management functions to be performed via client applications. The dynamic, rules-based nature of the system allows flexible tailoring for current and future business requirements. Real-time and background system monitoring functions are accomplished through electronic query facilities.